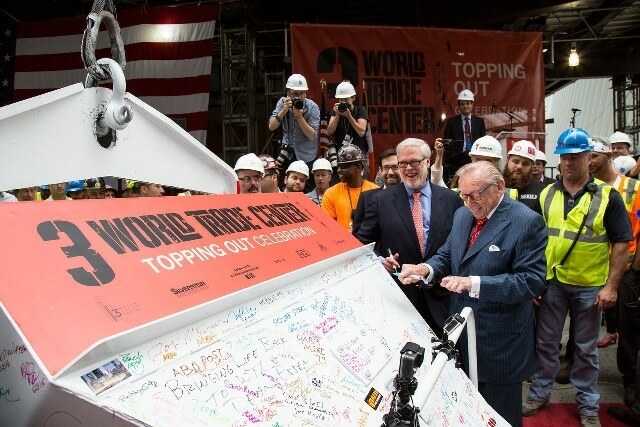 Silverstein Properties Chairman Larry A. Silverstein was joined by approximately 1,000 union construction workers and leading New York government, civic and business officials at a topping out ceremony marking the completion of concrete construction for the new 3 World Trade Center. The final concrete bucket, which was adorned with the same American flag that was used at the topping out of 7 and 4 WTC, was signed by Mr. Silverstein, construction workers and the assembled dignitaries. It was then raised 1,079 feet in the air and placed at the top of the 80-story tower. Larry Silverstein said, "Today we celebrate New York's construction workers whose dedication and determination have helped us reach this great milestone. It also reminds us of how far we have come: 3 WTC will be the newest addition to a neighborhood that has been amazingly transformed and revitalized over the past 15 years. With two spectacular new train stations, hundreds of new shops and restaurants, parks and tens of thousands of new residents, Downtown has clearly become New York's most exciting live-work community." Janno Lieber, President of World Trade Center Properties, an affiliate of Silverstein Properties said, "Like 4 and 7 World Trade Center before it, 3 WTC is attracting some of the City's most creative and innovative businesses. When the building opens in 2018, GroupM will join Condé Nast, MediaMath, IEX and other leaders in the worlds of media, technology and creative services that are making the new World Trade Center the best place to work in New York." Designed by award winning British architects, Rogers Stirk Harbour + Partners, 3 World Trade Center is located at 175 Greenwich Street and bounded by Cortlandt Way, Greenwich, Church and Dey Streets. At 1,079 feet and 80 floors, the 2.5 million square foot tower is envisioned to be the third tallest skyscraper on the World Trade Center site – and will be the fifth tallest in New York City upon completion in 2018. A model of transparency and sustainability, the building will feature floor to ceiling glass, and all eight corners on each floor will be column-free, creating an open and highly-collaborative workspace environment, which is key for cutting-edge companies in brainpower driven businesses like technology, advertising and branding, as well as law and financial service firms. Approximately 700,000 square feet of the building will be occupied by GroupM, the world's leading media investment management group. The tower consists of a reinforced concrete core with steel structure outside the core, and is clad in an external structural steel frame. A defining feature of the building is its load-sharing system of K-shaped bracing, which helps articulate the building's east-west configuration. 3 WTC has been designed to a Leadership in Energy and Environmental Design (LEED) Gold level of sustainability – like 4 and 7 World Trade Center, which was the first LEED-certified office building in the City when it opened in 2006. 3 WTC architect Richard Rogers said, "Larry Silverstein has been a powerful and visionary client determined to bring back both commerce and vitality to this key neighborhood. 3 World Trade Center stands next to the new train station making commuting easier and more environmentally sustainable. The tower stretches up to the sky. Its form celebrates and expresses the language of construction and technology which gives it scale, light, shadow and verticality." Ivan Harbour, Senior Partner, Rogers Stirk Harbour + Partners said, "It has been a huge privilege to have had the opportunity to build tall in the world's most iconic modern city. Our responsibility to Manhattan and the new World Trade Center is, we hope, reflected in the optimism of 3 World Trade Center. This is a skyscraper that celebrates holistic design and construction in its scale and grain whilst engaging with the public realm around it in a positive and uplifting way." 3 WTC was designed to enliven and seamlessly integrate into Downtown's streetscape thanks to a major concentration of retail on five floors above, below and at street level. The tower will also connect to underground pedestrian concourses that lead directly to 11 subway lines and the PATH trains. Retailers and restaurants at 3 WTC include Tiffany's on the ground and second floor, British steakhouse Hawksmoor on the third floor and Parisian bakery Ladurée on the ground floor. Below grade retailers include Turnbull & Asser, Bose, Tissot, Montblanc and many others. The conceptual design for 3 World Trade Center was unveiled by Silverstein Properties in September 2006. In July 2010, foundation work began, and in March 2012 the ground floor slab was completed. Steel erection began in June 2012 and will conclude this fall. Glass curtain wall installation began in May 2013 and the building will be fully enclosed in October 2017. 3 World Trade Center is scheduled to open in 2018. Silverstein Properties' current MWBE commitment for 3 WTC is $402 million, which represents 40% of all contracts awarded. Minority and female workers make up 36% of the skilled labor at 3 WTC. These numbers are unprecedented for a project of this size, and far exceed the voluntary 15% goal set forth in Silverstein's agreements with the public sector. "I couldn't be more proud of the 2,300 union construction workers who have already put in over 5 million hours to build this tower from bedrock to 1,079 feet," said Gary LaBarbera President, Building and Construction Trades Council of Greater New York. "It now stands as part of the skyline of New York as a testament to New York's resolve to never give up, always move forward, and build New York bigger, better and stronger."